A pensioner has stunned doctors by halting an incurable blood cancer in its tracks – with wonder spice turmeric. Dieneke Ferguson, 67, is leading a normal life more than a decade after being diagnosed with deadly myeloma. She turned to the popular curry ingredient in desperation when chemotherapy and stem cell treatments failed. Ms Ferguson began taking 8 grams of curcumin – one of the main compounds in turmeric – each day in tablet form. It’s the equivalent of about two teaspoons. Her illness has an average survival of just over five years – making it one of the most fatal forms of the disease. It was rapidly spreading – causing increasing back pain – and she had already had a second relapse. Dr Abbas Zaidi, a haematologist at Barts NHS Health Trust, said: “Here we describe a myeloma patient who started a daily dietary supplement of curcumin when approaching her third relapse. The remarkable improvement described in BMJ Case Reports follows previous research into the health benefits of turmeric which is packed with antioxidants. Since the turn of the century more than 50 clinical trials have tested curcumin – the pigment in turmeric that gives it that bright yellow colour. These suggest the spice can protect against lung disease, myeloma, cancers of the pancreas, colon and breast as well as Alzheimer’s, heart disease and depression. It has also been shown to help speed recovery after surgery and effectively treat arthritis . 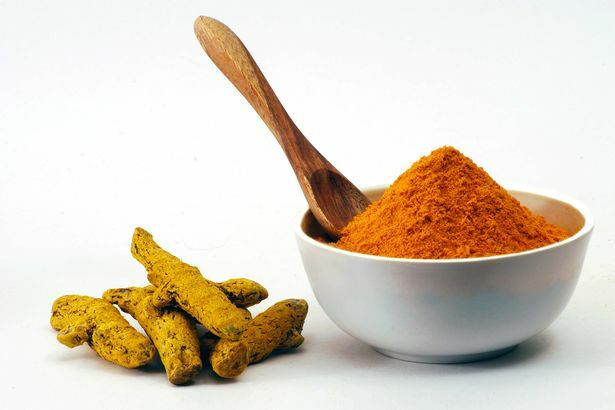 Writing in BMJ Case Reports, Dr Zaidi said: “Curcumin is a polyphenol derived from the perennial herb turmeric and has – for centuries – been used as a traditional Indian medicine. “Several reports published over the two decades have claimed various health bene ts of curcumin and this has led to its increasing popularity as a dietary supplement to prevent or treat a number of different diseases. Ms Ferguson was diagnosed with myeloma in 2007 and seemed to have little hope when she began taking curcumin in 2011. Some seek to use dietary supplements but while they may help to improve quality of life there is little evidence they can increase survival. Dr Zaidi added: “Among them, curcumin, the active constituent of turmeric, has gained popularity as a complementary therapy in several cancers. Ms Dieneke continues to take curcumin without further anti-myeloma treatment and her cancer cell count is negligible. As kitchen turmeric contains two per cent curcumin it would be physically impossible to eat enough to get the same dose. Ms Dieneke, who lives in north London, first came across the potential remedy on the internet and decided to try it as a last resort. Every year about 5,500 people in the UK are diagnosed with myeloma.